I made this chocolate bark to bring to a work holiday party, and then made a second batch to give as gifts (and eat). It’s ridiculously easy, but there are also a few tricks to make it come out right and not turn chalky white on top the next day, which is what happened with my first batch. First, get about a pound of high quality bittersweet chocolate. I got big blocks of it at Fairway – any market like this should have large quantities of good chocolate. Break the chocolate up into smaller chunks and melt it slowly in a double boiler. I don’t own a double boiler, so I improvise with a smaller pot inside a larger pot filled with water. It’s important to use the double boiler technique when melting chocolate so that it doesn’t overheat and burn, or get grainy and lumpy. Chocolate is very fussy. Stir periodically with a rubber spatula until it’s fully melted but not overheated. then pour it out onto parchment paper on a baking sheet and spread it into a thin even layer. Then add whatever toppings you want! 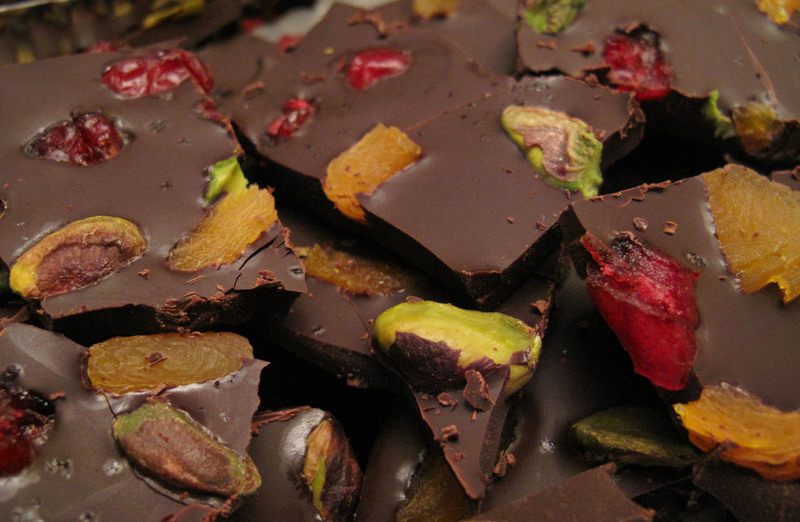 For this one I did pistachios, dried apricots, and cranberries, with a tiny sprinkle of coarse sea salt on top. You could also do candied ginger, other kinds of nuts, peppermint, pretzels, etc. The possibilities are pretty much endless. After adding the toppings, let it cool for about 2 hours. After 2 hours in a hot apartment with no thermostat, mine of course still hadn’t cooled so I threw it in the fridge. DON’T do that! It tasted fine but the next day it developed a chalky white appearance on top. I should have remembered from Food Science class if chocolate goes through extreme temperature changes quickly, it will develop a “bloom.” Since there is nowhere in my apartment that is the ideal temperature for chocolate (60 F), I cooled my next batch on the windowsill. After it’s cool, break it up or chop it with a knife, put it in a cute tin or container, and you’ve got gifts! (Provided you don’t eat it all while making it). Happy holidays! This entry was posted in Cooking adventures and tagged chocolate, dessert, gift. Bookmark the permalink.